A few months ago I got an e-mail from a lady. She said her elderly father was a big fan of mine and listened to my CD’s in his car every day. I wondered if this man was sane. My wife can’t even listen to me every day. And my kids … they have good days and bad days. So, I was both flattered and concerned. She went on to say that recently her father sold his car and forgot to take the CD’s out first. The new owner would not relinquish them and her Dad was upset with himself for not keeping them. Okay, now I was a little more concerned. My family would easily sell me and the car if they could get a few dollars out of the deal. Either this guy is truly my biggest fan, or someone is playing a prank. The lady offered to buy new copies of he CD’s and wanted to know where to send the money. I told her I would send them at no charge and mailed a couple out her way. Then I totally forgot the email exchange … until yesterday. 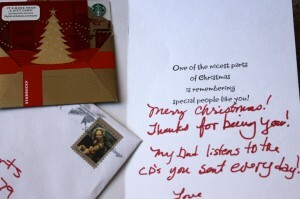 I went to pick up my mail at the post office and found this Christmas card. A card thanking me for being me. And a reminder that her dad is still my biggest fan. That really made my day. 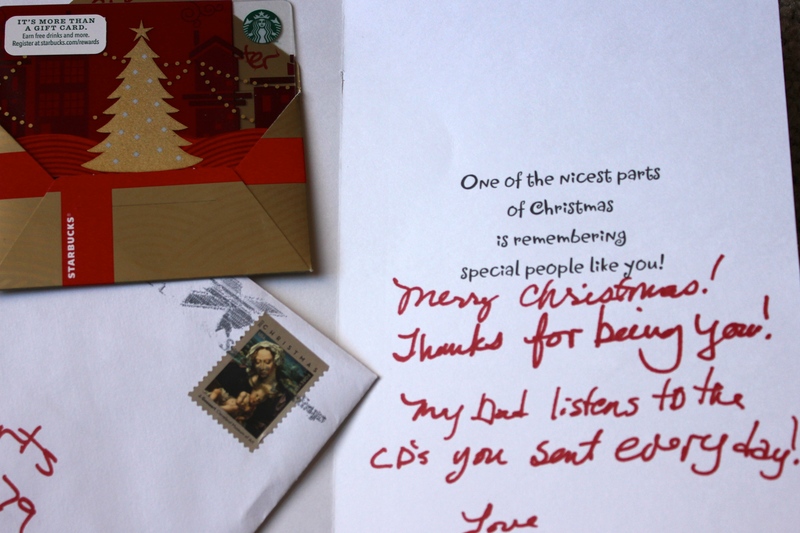 The fact that the letter also came with a Starbucks gift card was extra cool. It is easy to forget the power of laughter. The way it can anchor a person in a good mental place. The way it can erase a little bit of the pressure of the day. Laughter, is indeed, good. So, I want to thank everyone out there for being YOU and for allowing me to bring some fun and joy into your life the way you have brought into mine. Now, I am going to try to find Eddie Van Halen’s address. I accidentally left a copy of “1984” in the glove box of my 1996 three cylinder Isuzu pick up truck. Have a great 2014 everybody!